Our girls were not early potty trainers. They were the children the other parents could look at and feel superior because at least their kid was doing better than that. On the flip side, once they were trained, they did NOT have accidents. Ever. So when L started coming home from school almost every day with wet pants, we were surprised. Our first thought was that it was a physical problem, but she didn’t have accidents at night or on weekends. We asked the teacher what might be going on and I had a motherly talk with L (girl plumbing is apparently Mommy’s job) about the importance of using the toilet at lunch and recess. That seemed to go reasonably well, but the accidents kept happening. We tried a checkmark list. We tried a serious talk about the social ramifications of smelling like pee. We tried bribery. We were at our wits end when Z happened to mention that L’s class uses funny toilets at school. Mystery solved. The little ones have regular toilets with seats, but from Grade 1 on the kids use turkish toilets. For the first few months, L had been sneaking into the little kid area to pee, but she got busted and sent to use the potties in her area. But she didn’t know how to use them, so was just having accidents. The Dilemma: How do you teach your daughter to use a toilet that you don’t use yourself? 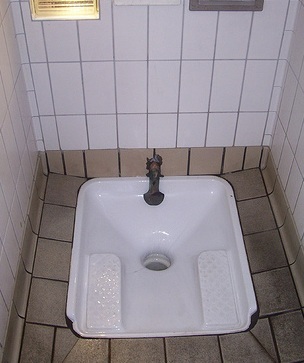 I’ve seen turkish toilets before, but I’ve always managed to avoid them. The first time I saw a turkish toilet, the previous user had been severely “aim-challenged” and the smell combined with the site of yucky brown gunk marred me for life. Fortunately, I discovered that there is almost always a handicap stall with a normal toilet you can use. And if there isn’t – well I’ve never had to go that badly. I was now able to have a theoretical discussion with L using a variety of visual aids and charades. But we were left with the practical application. How could we find a turkish toilet to practice with? We got lucky on our trip to Italy and stopped at an Aire (truck stop) just outside of Monaco. They had a clean turkish toilet and I was able to demonstrate the finer points of use for my child without sacrificing my shoes. My sympathies to L. I don’t think that I would know how to use one either. dad says—–remember the pit toilets when we were camping? Hi Vered. I guess that’s how they make you tough? All about the not sitting around with a magazine? I don’t miss those! I did talk to a French woman who said she preferred them. That way, she wasn’t touching a toilet seat shared by lots of people. No idea if that’s a common attitude, as it didn’t come up in conversation that often, oddly enough. Poor L. I’m glad to hear she’s on the right track at last. The house we lived in before we came to the States had a Turkish toilet. It was narrower and more toilet shaped than the one in your picture. You placed your feet to the sides of the hole, not in the toilet area. When I’ve had the opportunity to use them in another country, it brought back childhood memories. As much as a toilet can bring back memories, anyway. I’m with L. I’d wet my pants too before using one of those!!! Way to go girl. Stand up for what you believe in. Poor girl had to get potty trained twice! Hi Val – Not just poor girl, but poor Mom who had to do potty training twice. I thought I was done with all of that. I’ve already got issues with our public North American bathrooms! I’m pretty sure those Turkish toilets would take me to a whole new level of pathalogical. What the heck happens when the knees reach the ‘protest/crackle’ stage of life??? And what happens when what has to happen doesn’t happen for many minutes??? Nope. I’ll keep my sit-down potty with the magazine beside it. Oh wow! Poor thing! I can’t believe they have those toilets at school! I’d rather go pee behind a bush than use one of those *gag* – I’ve always had an irrational fear that I will fall into it and/or a rat will come up and bite my bottom! Eek … sympathies! Thanks for the comment MiP. I thought it was only North Americans who didn’t like them. I’m with “Aunt L” — used them in Ukraine, and trust me, they don’t shine like that. On the flip side, when I was working at a church in Toronto, we rented space for a program for new immigrants. Imagine the mystery when we found shoe prints on the toilet seats! Apparently changing toilets is a mystery for everyone. And when I considered it (after posting “don’t stand on the toilets” diagrams), I imagined the horror in their hearts when they realized they were supposed to SIT ON (ie TOUCH WITH BARE SKIN) these toilets that everyone ELSE had SAT ON in order to do their business. I must confess – I suspect that the North Americans came out looking a little barbaric in that scenario. A friend sent me a picture of a”don’t stand on the toilet seat” sign from Singapore. Apparently the standing on the seat thing is a real problem in SouthEast Asia too. The women’s toilets at French railway stations are of the Turkish type. Apparently. So I’m told.